Flippagemaker Free OCR Converter is 100% free Optical Character Recognition Software for Windows and supports scanning documents from scanner and extract characters from the scanned images. It is as well as available to popular image formats such as JPG, PNG, GIF, and so on. It helps to get plain text directly in the window or save text file. The free OCR provides two interfaces to choose from. It can be operated much more user-friendly as you can choose your favorite layout. The OCR can show images and extracted text together in side-by-side window. If you are not English speaker, you can install your native language and extract text in other language. The software would be really helpful and save you a lot of time. Why Free OCR is necessary? Text is searchable online while characters in images are not. When you publish images or books online, searchable text is need to make webpage SEO friendly. More and more potential customers can find your website and it will help in sales to some extent. There may be some image files with characters description and you want to get the information. However, type it manually will cost you a lot of times, especially when there are a large amount of images. Flippagemaker Free OCR can process unlimited image files at once. If you want to extract text from page materials, Free OCR can also help. It can select and import scanned images and recognizes text conveniently. Page material is necessary in office working. We need printed page in a meeting especially. And it will be much better if the information on page can be extracted and save as e-document. Otherwise, in the Flippagemaker Free OCR, you can only OCR selected page or OCR all pages. And what's more, if you need to save extracted text as TXT file, just OCR and save it at the same time. 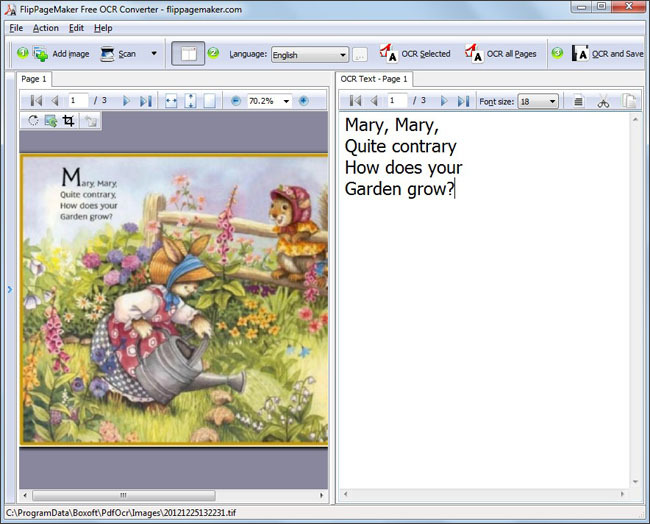 All in all, the excellent image processing feature works perfectly in Flippagemaker Free OCR Converter. Seekways Ico Maker (Popularity: ) : Create icons from images of any format in a fast manner with this ico maker. Simply browse to an image on your hard drive then select a size of 16x16, 32x32, 48x48, 64x64, 128x128, or make a custom icon size.